From the outside, Henry Darger lived a quiet, menial life. He lived for his entire adulthood in a one-and-a-half bedroom apartment. He worked as a dishwasher, a bandage roller and a janitor. He had one close friend, Whilliam Schloeder. He attended mass five times a day. It was only shortly before Darger's death, when he was living in a nursing home, that his landlord Nathan Lerner stumbled upon the belongings he would end up leaving behind. There were some old Pepto Bismol bottles, plastic maple syrup containers and thousands upon thousands of pages of text and images, from diary entries to epic novels to comic-style drawings of big adventures starring little girls. Darger was born in Chicago in 1892. He lost his mother at four years old, while she was giving birth to his younger sister, who was immediately put up for adoption. Darger lived with his father until age eight, when his father was no longer able to care for him and put him up for adoption. A few years later Darger -- who earned the nickname "Crazy" in school -- was committed to the Asylum for Feeble Minded Children in Lincoln, Illinois, a derelict and abusive institution riddled with horrific scandals. During Darger's stay, other travesties occurring on the premises included "a child ravaged by rats, a doctor who died after attempting self-castration, [and] a teacher who used inmate corpses for anatomy lessons." 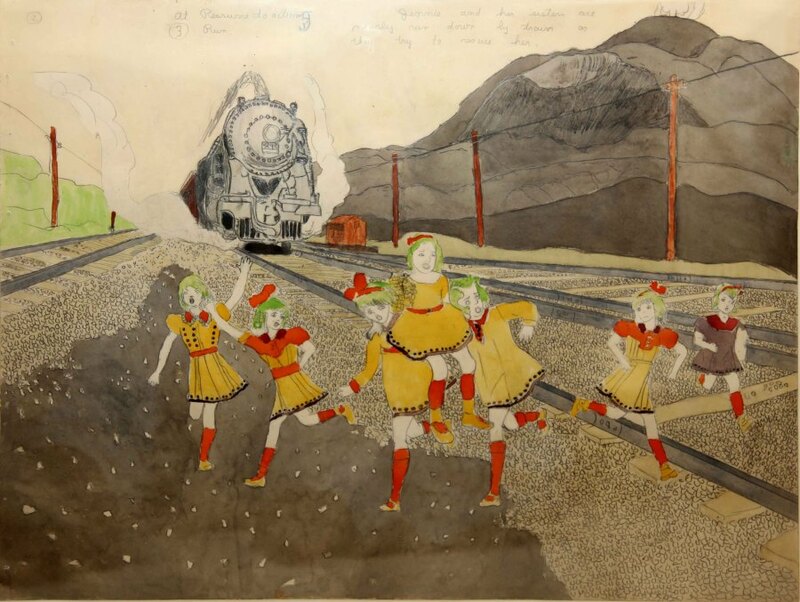 Darger escaped at 16, hopped a train, and returned to Chicago. For years Darger lived a modest, solitary adult life, working humble jobs at several Catholic hospitals without much human contact. However, in the privacy of his home, he'd enter another world, one ravaged with war, perversion, beauty and innocence. His magnum opus, titled The Story of the Vivian Girls, in What Is Known as the Realms of the Unreal, of the Glandeco-Angelinian War Storm Caused by the Child Slave Rebellion, is the longest known work of fiction ever made, measuring in at a whopping 15,145 pages, not to mention the 8,000-page sequel. (Darger wrote the whole thing by hand, and then went back and typed it.) He also created a 5,000-page autobiography and kept daily entries on the Chicago weather report for 10 years. Realms of the Unreal, as it's known for short, is a war story chronicling a battle on an imaginary planet between the evil Glandelinians and the Catholic Abbieannians. The Glandelinians are Satan worshippers, known for enslaving, torturing and disemboweling children. The good Abbieannians are led by the Vivian Girls -- Violet, Joice, Jennie, Catherine, Hettie, Daisy and Evangeline -- seven princesses, brave and pure fighters who constantly face danger to save children and fight against darkness. And then there were the images. Hundreds of works up to ten-feet wide, from watercolors to mixed media collages, bringing Darger's convoluted tales to life in obsessive detail. Unconvinced of his drawing talent, Darger would draw or paint over news photos, then collage them into his monumental images. His large works sometimes took months to draw out, and additional months to color in. The works are as ambitious in their precision as they are in their magnitude, with details seemingly burgeoning of their own volition on all corners of the canvas. Upon first glance, Darger's artwork appears whimsical, virtuous, even sweet, with cartoonish young girls sprinkled across pastel-tinted landscapes populated by butterflies, flowers and puffy clouds. Yet it's this very bounty of innocence and sentimentality that makes the twisted works all the more horrific. The graphic details of Darger's writing are explicated without reservation -- all the torture and pain laid bare on the page -- to make it all worse, in candied colors. To add an additional layer of strangeness, Darger often depicts his little girls naked, and often with penises. Though the rationale behind the male genitalia is not known for certain, some attribute the creative choice to Darger's personal battle with gender. One of the fictional characters in his book Crazy Horse once said he was "angry at God for not having created him into a girl which he wanted to be more than anything else," a sentiment possibly echoed by Darger himself. In Jim Elledge's biography of the artist, he postulates that the gender ambivalent characters embody Darger's own frustrations that his anatomy and desires did not line up. As embodied quite literally in his Vivian Girls, Darger's work is often furiously ambiguous, teetering between good and evil, innocence and perversion, childhood and adulthood, virtue and wickedness. As Charles Russell writes in Groundwaters: "'Which side are you on, Henry?' we find ourselves asking, only to imagine the anguished response, 'both, alternately! simultaneously!'" 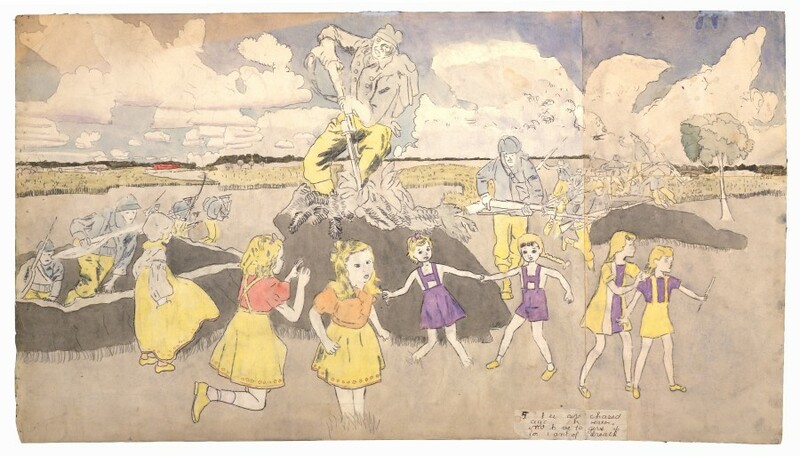 In Darger's work we can see the war raging within his mind, his own religious imperatives combatting his darker desires, as his Vivian girls play both victorious heroes and vulnerable victims of endless torture and abuse. 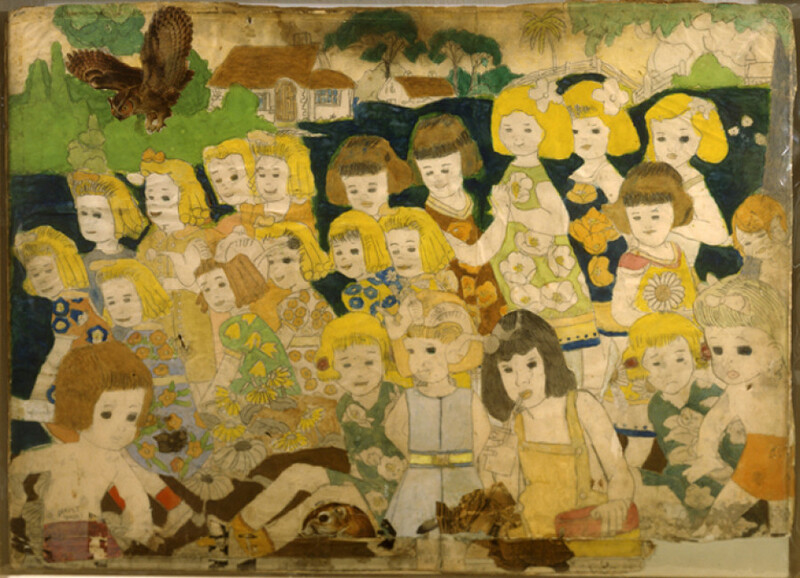 Darger was obsessed with the innocence of children, and blamed adults for their impending corruption. "Babies," he once wrote, "were more to me than anything, more than the world." Some have attributed this to Darger's own loss of innocence at such a young age, with the death of his mother and the disappearance of his little sister whom he never even met. Darger established a club called Children's Protective Society for the sole purpose of protecting young children with one other member, his friend Schroeder. Mystery surrounds the life and mind of the reclusive Darger, a man whose tombstone eerily reads: "Artist, Protector of Children." Like many outsider artists, Darger's life was plagued with darkness, obsession and chaos. However, due to his ability to function relatively "properly" in society, some argue Darger falls more into the category of self-taught artist than outsider. The ambiguity is not surprising given the anomalous spirit of Darger's oeuvre. Perhaps the tension relates to the viewer's assessment of the work: Is it the aberrant expression of an outsider's perverse desires or an obsessive illustration of the turmoil within us all? Is Darger one of us or not? Darger's work will be on view courtesy Andrew Edlin Gallery at the Outsider Art Fair, from January 29 until February 1, at Center 548 in New York. Correction: An earlier edition of this article mistakenly stated Darger was born in 1982 instead of 1892. We regret the error.